Until the year 1793, the bridge (above pictured) from the Bucklin lands and growing Rehoboth village on the east side of the Seekonk River (right side of above photo) to the mills and Pawtucket village on the west side of the Seekonk River, was the only bridge connecting Rehoboth and Providence. Providence, travelers heading north to Boston by foot, horse, or stage benefited specially by using the bridge. Travelers from Providence, south of the bridge, to Rehoboth south of the bridge, or to any part of southern Rhode Island, such as Bristol, found the detour north to use the bridge added about 8 miles at a cost of a substantial time investment. (The standard foot pace is 3 miles an hour; a trotting horse speed is 8 miles an hour.) 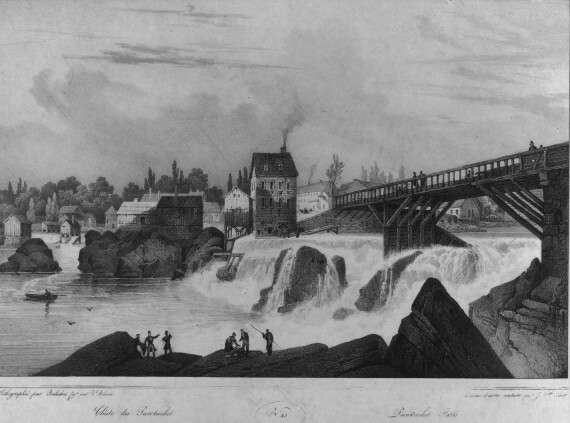 Consequently, for persons not involved with travel to or from Boston or other north Rhode Island or Massachusetts towns, in the century before 1793, more direct routes from Providence to Rehoboth were developed over “upper” and “lower” ferries located about four miles to the south of the Pawtucket bridge. In 1792, Moses Brown and others applied to the Rhode Island Legislature for a charter for a toll-bridge over the “Narrows” at which the “upper” ferry operated. A charter was granted for a “Central Bridge”, which was built the following year, of wood, with a central draw of 24 feet in width to allow for the passage of ships to Pawtucket. The Central Bridge was a toll-bridge to pay for the bridge errection, and was early known as the “Moses Brown Bridge”. This 1792 bridge was near the site of the present (2006) “Red Bridge”. (See map of 1798). At the same time, the Legislature granted a charter for a “Washington Bridge” at the site where the “lower” ferry operated. Again, this was built of wood, with a 24 foot draw, and was a toll-bridge.